“It’s hard for me to go to the health centre, so it’s good that health staff come to us,” says 28-year-old mother of three Min Navy. “If services didn’t come to us, I would have to go to the centre, but I only go when I have the money for transport.” It might only be a few dollars to hire a motorbike taxi to the health centre, but for households like Navy’s this sum is significant. During the rainy season, it could take the families about one hour to reach the health centre. To help families like Navy’s, the Provincial Health Department, with support from UNICEF, has been sending mobile health teams to remote communities once every two months. In Voeunsai district, where Phnom Kok Lak is situated, there are two outreach teams delivering services to 17 remote villages. UNICEF provides essential supplies such as vaccine shots and vaccine storage material and financial assistance to cover the cost of transportation for the health staff and their per diems. These services are essential for Ratanak Kiri’s vulnerable women and children. While health outcomes for pregnant women and newborns in the province have been improving – e.g., in 2014, 54 per cent of women gave birth at facilities with skilled birth attendants compared to 38 per cent in 2010 – the province lags behind national averages in several areas. The percentage of pregnant women who receive the recommended four antenatal care check-ups is only 48 per cent, well below the national average of 76 per cent. Pregnant women also use prenatal care less frequently than average Cambodians, and newborns receive less vaccines against measles (56 per cent in 2014, compared to 78 per cent nationwide). 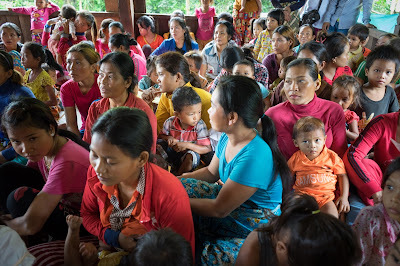 Nearly half of pregnant women in Ratanak Kiri still gave birth without skilled attendance. The mobile health teams represent an important opportunity for these families to access health care that protects them from unnecessary illness and change the course of lives for the better. After the outreach staff arrive to Phnom Kok Lak, they quickly set up their workstations and by 8:30 a.m., the makeshift health centre is hustling and bustling with a large crowd of children and adults. 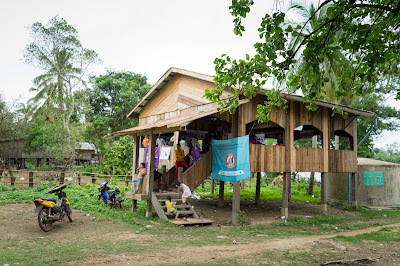 The team has divided the stilted traditional house’s single room into small sections, each offering a different service: vaccines against preventable diseases like polio, tuberculosis, measles and tetanus; vitamin A supplementation and deworming tablets for children; antenatal care; and health and nutrition classes. 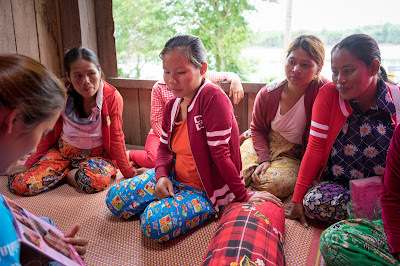 While they wait to see the health workers, mothers and grandmothers receive messages from the village health support group volunteer about health, nutrition and hygiene. The volunteer, Kouk Dang, is a member of Phnom Kok Lak village who has been trained by the health centre to conduct awareness classes and advise families on a regular basis. Min Navy, who very recently gave birth to her third child, attended these classes during her pregnancy. She also received four antenatal care check-ups. “I learned a lot from these classes. The different types of food that children need to eat, that alcohol, smoking and hard labour are not good during pregnancy, and the importance of breastfeeding and vaccination for children,” she explains. When their turn comes, children, mothers, and pregnant women proceed to the registration desk. There, they present their yellow health card and the staff enters basic information into a record book. They then proceed to the vaccination corner, where children receive immunizations against polio, hepatitis B, meningitis, mumps, rubella, diphtheria, pertussis (whooping cough) and tetanus. They also receive vitamin A and deworming tablets. Women receive tetanus toxoid vaccines. In another corner of the room behind colorful curtains, pregnant women receive antenatal care services from a trained health centre midwife. During the antenatal care sessions, she learned about good nutrition and health during pregnancy and the importance of check-ups. Her younger child (now 4 years old) received the minimum package of health services and her newborn gets vaccinated during today’s visit.